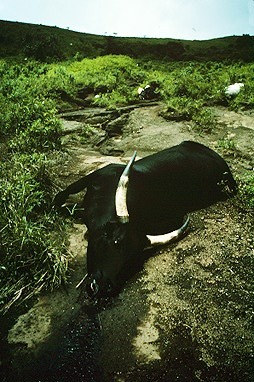 The first known case of lake overturn occurred in Lake Monoun in Cameroon. A cloud of deadly carbon dioxide gas was released from the lake early in the morning one day in 1984. In total 37 people were killed and bodies were found lying in the road and in trucks. Fortunately the gas did not reach any highly populated areas. The bodies were discovered as though they had died suddenly without a struggle in the middle of everyday tasks. A truck carrying twelve people was in the path of the gas. The engine stopped working and the driver and people from inside the truck got out to see what was wrong and were all killed. The two people sitting on top of the truck survived as they were above the gas and could still breathe. Initial responses were that the people had been killed by a deadly disease or were the victims of the testing of a new biological weapon. Scientists from America investigating the disaster discovered that the lake contained large amounts of carbon dioxide and after further investigation of the tragedy at Lake Nyos which happened two years later, formed the theory of lake overturn.